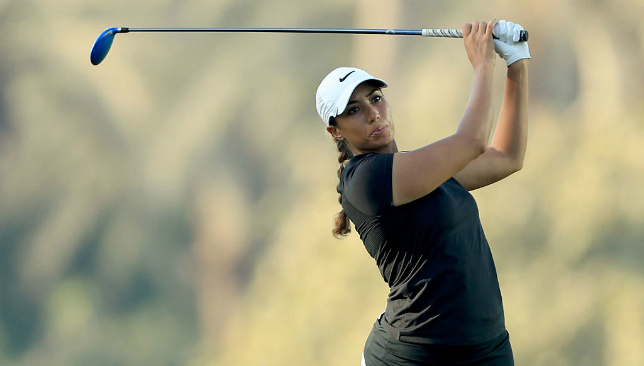 Cheyenne Woods has slowly established her own place in women’s golf, but it was impossible not to swamp the young lady with questions about her uncle, arguably the most famous man in world golf. Tiger Woods made a stunning return to competitive golf after almost 16 months of injury lay-off, during which he endured his second and third microdiscectomy procedures, last week. The 14-time major champion finished 15th in the 18-man Hero World Challenge, but showed enough proof that his game was on the right track as he looks forward to playing a full schedule next year. Cheyenne, a winner on the LET in Australia in 2014, secured her card on the LPGA Tour by finishing 96th on the Money List this year. She did expect most questions to be centred around Tiger, and was happy to share her thoughts. “I haven’t spoken to Tiger, but to see his comeback, and everyone was anticipating this week of golf that he just played, and so I was real excited to see him not only on the golf course, but on the golf course playing well,” said the 26-year-old from Phoenix, Arizona. “That’s the Tiger we’ve all missed. I think everybody was happy to see the fist pumps and see him making birdies and holing out bunker shots, because that’s the Tiger we all remember. Cheyenne said Tiger playing well also gave her slightly different mind-set going into this week’s Omega Dubai Ladies Masters. “I think the thing I get from watching Tiger play, and watching Tiger play well, is just being inspired. Just seeing how hard he’s worked, and you know how hard he’s worked into coming back from his injury and getting back into playing position,” she added. Cheyenne is paired with another American, Paige Spiranac, and Wales Amy Boulden. They tee off at 7:55 from the 10th tee. One tear, and one tweet, at a time, Paige Spiranac is determined to change the world. Golf plays an important role in that process, but it’s not the be all and end all. A year after making her professional debut in the Omega Dubai Ladies Masters last year, the 23-year-old American is back at the tournament. There is no denying the ambitions of Spiranac, and the passion with which she pursues golf, but her invitation last year was more because of her social media skills. There was criticism of her getting a spot that could have gone to a more ‘deserving’ professional. And as soon as she missed the cut, her social media timelines were filled with several hurtful messages, which unfortunately stood out amongst the many supporting ones. The messages ranged from telling her she sucked at the game, to accusing her of being promiscuous. It was a lot more than what the emotional Spiranac could take, who went into depression, gave up on her Twitter and Instagram accounts for some time and even entertained thoughts of giving up the sport she loved. After wallowing for a few days, Spiranac decided to fight back. She took up the battle on two fronts – one, getting better at golf itself, and two, getting stronger mentally. She hooked up with swing coach Tyler Hall, and the improvement is discernible. She made the cut at the Scottish Ladies Open on LET, and won a professional feeder tour event in the US. She also started counseling with Dr Nick Molinaro, and it has changed the way she looks at the world now. The happenings of last year left a deep impression on Spiranac though. Golf is no longer the most important thing in her life – growing the game is, and so is raising awareness about cyber-bullying. She started an emotional press conference yesterday saying her No1 objective for the week was not to cry. Less than five minutes into the interview, she could not stop the flow of tears. “I actually don’t remember much of last year. I was so emotional, so stressed out. It was great but it was also, my first pro event, I was so nervous and I was getting a fair amount of negative media attention, too. It was something I wasn’t used to. It has really helped me out a year from now,” said Spiranac. “I said it was the hardest experience of my life but it made me so much stronger as a person, also as a golfer. “Right after that, I switched coaches, got a mental coach, and really took my game seriously and want to take it so the next level, and also as a person. I grew up and matured. It also made me realise that golf isn’t the most important thing in my life. “So this year, I’m really going to work with anti-bullying organisations and focus on cyber-bullying. Everything I endured last year really took a toll on me mentally and I suffered from some depression and anxiety because of all the cruel things people were saying about me. “Cyberbullying is a huge problem and no one ever discusses it. They never talk about it. It needs to be talked about and needs to be brought to the subject. It’s no longer funny. It’s not the cool thing to do to make fun of other people. “I want to grow the game and I think that’s the most important thing. So I embrace the media now. I embrace my platform now and use it for good. I do everything I can to bring attention to this tournament for the best players of the world. This tournament deserves that and with Suzann Pettersen and Shanshan Feng and Charley Hull playing; to give them that recognition they deserve is great. This first National EGF event of 2016 – 2017 season saw Mahmood Skaik claim the event with a Stableford score of 38 points. Humaid Al Mazroua finished runner-up with 36 points, while third-place went to Rashid Al Jarwan with a total of 34 Stableford points. The Best Gross Award went to Mohammed Al Hajeri who shot a four-over-par, 76 after shooting a 39 front nine and 37 back nine. Awards were also given based on handicap with an A-Division [0-14 handicap] and B-Division [14-24 handicap] winners. Winning the A-Division Prize was Sultan Al Ali and in the B-Division equivalent it was Shawqi Sajwani who came out on top. The event also hosted a Junior Division with six competitors that saw Alia Al Emadi win her first competition with 39 Stableford points. Her brother, Rashid, came in second ahead of Reema Al Heloo in third. The first UAE National Monthly Medal of the 2016 – 2017 golf season will take place on December 31st at Al Zorah Golf Club.